Thirty firefighters have died while tackling a huge forest fire in south-western China, officials say. Fire crews had been battling the blaze in the mountains of Sichuan province on Sunday when a change in wind direction caused "a huge fireball", trapping them, the emergency ministry said. Contact with 30 firefighters was lost. 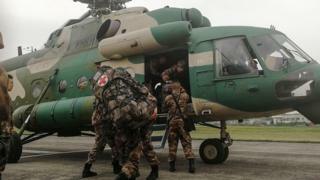 All were confirmed dead on Monday and their bodies were retrieved from the mountain, state TV said. The blaze broke out on Saturday. About 700 firefighters have been trying to control the flames in a remote area of Muli county, state media reported. A separate forest fire in the northern province of Shanxi was brought under control on Sunday after burning for two days, the official Xinhua news agency said. No casualties were reported from that fire, but at least 9,000 people were evacuated from their homes.